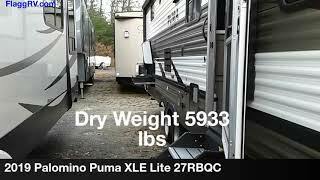 Hi, I am interested in your 2019 Palomino Puma (stock #02943) listed on Autotrader for $22,250. I'd like to get more information about this vehicle and confirm its availability. Palomino has graciously included with this trailer one year of 24/7 emergency roadside assistance through theCoach-Net RV Technical and Roadside Assistanceprogram, which means that you can travel worry free every time you are on the road. TheLED lightingthat is located throughout the trailer will keep your eyes and your wallet happy because of the brightness it brings to the trailer and the money it saves you on energy bills. Theskylightin the bathroom allows some extra sunshine to add a bit of cheeriness in the morning, and thetinted windowsthroughout the trailer are helpful in preventing fading of precious items inside.